At the turn of the 20th century, Winnipeg was buzzing with activity. It was the main metropolis of the prairies at which to stop and stock up on necessities as adventurers continued their quest to the west. Many entrepreneurs, though, saw it as a great place to make their fortunes and stayed to make their mark. Lieutenant Colonel Thomas Scott was one such visionary. After commanding the Ontario Rifles in the first and second Red River Expeditions, Scott retired in 1874 and started a furniture company in Winnipeg. 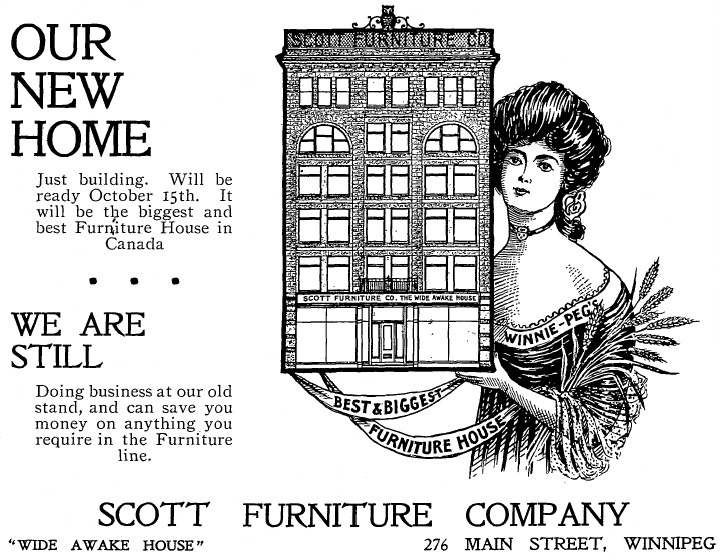 Touting Scott Furniture Company as the premier place to buy fine furniture, business was brisk as he supplied tables, chairs and bedding for the new hotels and schools appearing all over Winnipeg and the empty prairie horizon. In 1904 the company hired acclaimed local architect James H. Cadham to build a new six-story retail store with warehouse space for the enormous sum of $50,000. Scott Block was built in the Romanesque Revival style, a derivative of Gothic Revival. The building featured rough surfaces, top-floor arched windows, low-profile ornamentation and a strong, solid shape. The upper floors were finished in cut red sandstone; interiors featured our famous limestone. Large, glass windows displayed furniture inventory; high ceilings were clad in pressed tin. The basement and mezzanine served as shipping department and storage. But months after it was built, Scott Block faced its first catastrophe when lightning struck the back metal fire escape. Fire spread quickly and utterly destroyed the building and all inventory. Reconstruction started immediately, led by Scott’s son Fred, who took over the business. He saw a need for office space in downtown Winnipeg and had the upper two floors of the now five-story building re-designed. They were leased out to the Canadian Northern Railway Company. 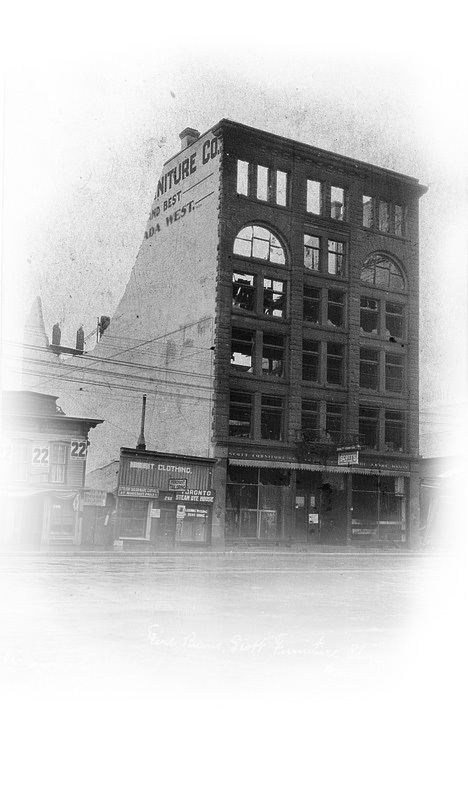 Business hummed along until another devastating fire in 1915, apparently caused by a carelessly tossed cigarette. Amazingly, although 100 employees occupied the building, no one died. It was the first time in Winnipeg’s history that firefighter safety nets were used to save lives. The interior was transformed from showrooms to office spaces in the next build, led by architects Ralph B Pratt and Donald A Ross, at a cost of $125,000. You won’t be surprised to hear that after two fires, safety was a crucial component of the 1915 plans, including an internal concrete frame which attached to the external walls. Scott Block has housed innumerable businesses over the years, some more successful than others, including real estate agencies, oil companies, lumber dealers, insurance agents and dentists. Curiously, several steamship companies were located in Scott Block over the years, including the Dominion Fish Company and the Cunard Steamship Line. Ironically, in the 1930s, Scott Block was sold to the Canada National Fire Insurance Company. And now the story becomes our own. In 2010, Space2Work purchased Scott Block and worked diligently to restore the building to its former grandeur, beginning with the removal of the metal cladding. After decades under cover, the cut red sandstone seems to glow anew. Happily, many of the original features remain or have been replicated, including the main staircase. The devotion to detail and craftsmanship is obvious in every studio and loft, and Space2Work has been recognized for its efforts. Scott Block is a municipally-designated historic site and received a 2014 Conservation Award from Heritage Winnipeg. After 100 years of fortune and infamy, Scott Block is poised to stand another century as a historic, stately building where dreams can be boldly forged in the heart of Winnipeg’s downtown. Moving day will be a cinch, as we’ve included not one, but two enormous elevators in our plans. Scott Block Lofts © 2019. All rights reserved.